1. 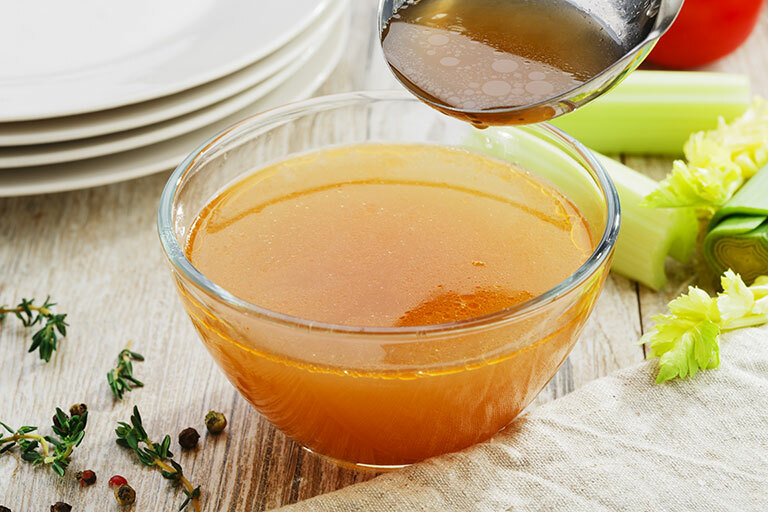 Place the bones in a slow cooker and drizzle the vinegar to coat all bones. Add in the vegetables, herbs, and salt. Add water. Stir to combine. 2. Set the slow cooker on low and cook for 12-16 hours. 3. When the broth is finished, discard the bones, vegetables, and herbs. Strain the liquid to remove all solids through a sieve into a glass container or 4-quart jar. 4. Refrigerate the broth for at least 3 hours. The fat will separate and rise to the top. Once the fat has congealed, skim it off the top to remove excess fat. Then store in mason jars or a thermos.